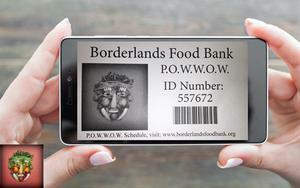 Borderlands Food Bank relies on volunteers to help at the P.O.W.W.O.W. distribution locations to provide the fresh nutritional rescued produce in the communities in Metropolitan Phoenix, Tucson and Southern Arizona. Volunteering is fulfilling and beneficial, there are various opportunities to help on a one-time, on-call or on a regular basis. Come join us. 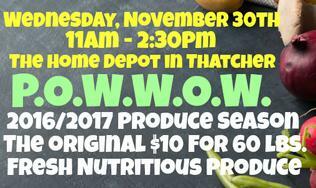 Borderlands Food Bank would like to introduce the Produce On Wheels With - Out Waste (P.O.W.W.O.W.) 16/17 produce season schedulefor Phx, Tucson, NW and SO / SW AZ service area (Please refresh your browser for the most current schedule) starting Sat., Nov. 5th. The original $10 for 60 lbs. of fresh nutritious produce. If you have a smartphone, take a picture of your Produce On Wheels With - Out Waste ID card, just in case you have lost your card or prefer to carry a electronic copy instead..
Do not have an ID Card? 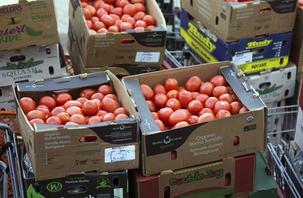 Give a Voucher for the Original $10 for 60lbs.Fresh Produce Box and help supplement meals nutritiously. All Occasions - Employee Appreciation, Thanksgiving or Holiday Gift, Birthdays or just simply wanting to help Families Eat Nutritiously.